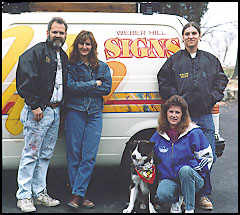 I started Weber Hill Signs in 1984, as a one girl shop owner, Kathy Weber. Being a graphics person, this was a great job to do on the side while raising 2 boys. The word got around, and I kept moderately busy, with time for the kids and extra income to boot. The sign trade magazines were always my link to the sign world and in 1991 I happened to see the announcement for a Letterhead Meet in Bloomington, IN. Only being two hours away, I immediately made plans to attend. It was total excitement, just being involved with all the talent, I'll never forget it. I laughed when I read how Steve took his portfolio back to the hotel after seeing the wonderful work on The Portfolio Table. Don't feel bad Steve because I did the same thing. It wasn't until Tom Durham, a friendly signguy I met there, persuaded me that I had the drive and was on the right track, that I finally developed enough confidence to expose my work to the others. Tom encouraged me tremendously. He said he remembered being there himself and how he had experienced the same feelings. All weekend people kept confirming that andI quickly felt very comfortable. Comfortable enough to do something silly like have the other sign people sign my painters pants. I still have those pants with many signatures from all the super people there. Maybe I'll take them to Fargo. Anyway, Tom and I found out that my Niece lived 2 blocks from where he worked at a sign company in Kansas City. Over the next couple of years, I would visit the shop when I was in Kansas City and we all became good friends. His sign buddies quickly accepted me. Tom had been in the sign biz all of his life and had lots of information he would share with me. It turned out that we enjoyed the same style of work and our styles were very similar. In addition, we both share a love of old signs and other antiques. Tom and I became inseparable, hopelessly in love. We decided on a permanent merger and Tom moved everything here to the St. Louis area. We were married at an 1880 log cabin in the area on Sept.30,1995. Letterheads from Kansas City joined us along with many sign people from here. It was a great day for us all. House Springs, MO is just a small town on the outskirts of St. Louis. We work at home or at least across the driveway. We have two buildings we work out of. The first is 24' x 45' with a three bay garage and office. The office was just remodeled. We put in two rooms, front reception and display, the back part is for the computer. At present I'm finishing the second building, 24' x 40', for doing all the wood cutting. Like most shops, we do a variety of commercial work. Trucks, commercial real estate, sandblasted wood and glass, plus all the wild and weird requests. We have been doing a lot of antique reproduction signs. These are the most enjoyable types since we get to be the customer, designer, and fabricator. We've had good response so far with them. We do about 75% of our work on the computer. I still get to throw some paint on once in a while. We have the Gerber Advantage with an additional Super Sprint hooked up for use as a cutter. We use a Cannon 600 color printer. We also recently bought a new Dell 16 ram Pentium with Windows 95. Now if I can figure how to network these together or at least get the most efficiency out of them. Likes and dislikes? Hey, signs are one.....like some, dislike many. Outside of work, I enjoy riding horses and Tom likes riding Harleys. The kids keep us pretty busy most of the time these days. As soon as they are gone, we hope to travel a little more. Right now we try to make a Letterheads meet or two each year. We have one invaluable employee, Sally Greenwalt, who has been with me 5 years, and is a dear friend too. We love our work and try to just have fun, learn and maybe make some money too. Tom & I do all the designing, painting and vinyl, Tom does the carpentry, and Sally takes care of all the paperwork. I am in charge of the sales. As a couple, working together has only been great for 2 years now and I don't expect that to change. This work allows us to be individuals and yet to be a team. We appreciate all that the Letterhead's offer and stand for and hope to always learn and benefit from our association with this terrific group.